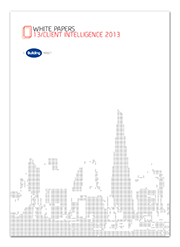 Available as a digital download, Client Intelligence 2013 is the ideal handbook for construction professionals, providing an overview of where the work is by sector and region, and a sense of what some of the biggest construction firms think about the state of the market. In such uncertain times for the industry, it is more important than ever to understand and be able to respond to your clients' needs, and be confident on the likely future direction of their pipelines. an opportunity to benchmark yourself as we reveal, from the top 30, the contractors, QSs and architects they are most likely to work with.